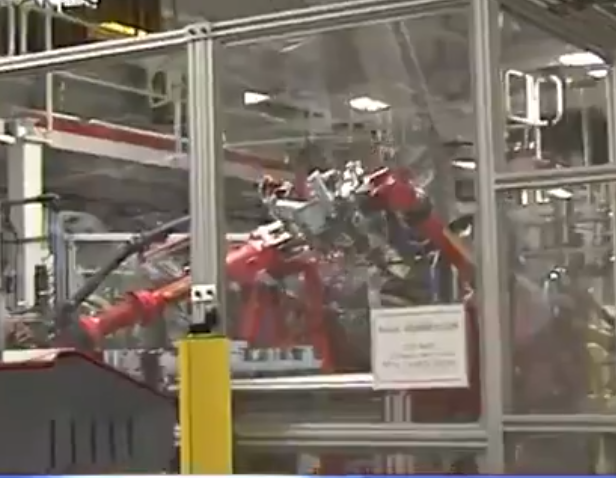 Tesla has been in the spotlight for the good reasons, they’re bringing us close to a better future with their electric cars and great quality in their products. 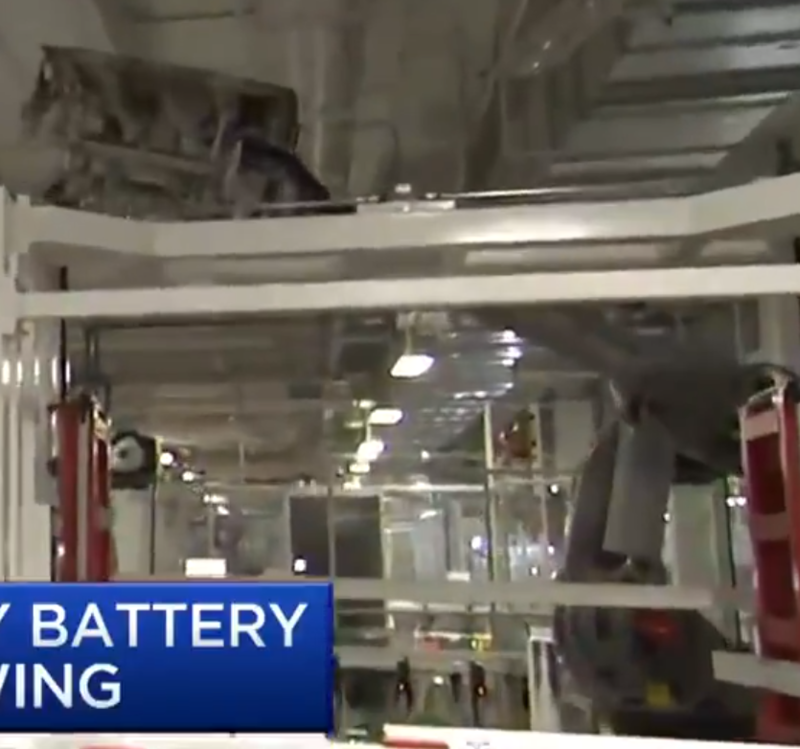 Their innovation on the automotiv market and their success has been widely covered by now, but, what we are about to do, is analyze what’s inside their factory, the factory that builds their batteries. 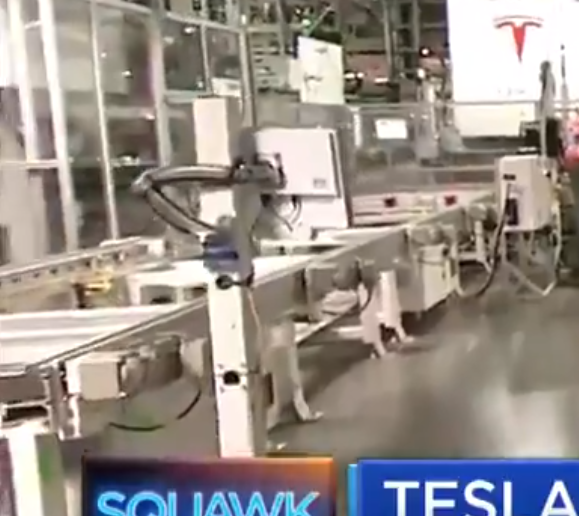 Well, if you want to do things like Tesla does or better, you have to know where they’re at now, what they do and how do they do it. That way you at least know where to start in the path towards a better quality of your process and/or product. This article (and future ones like it) is based on these type of articles, in which with little material, the author goes through a complete dissection of it to understand everything that the eye can’t perceive easily. 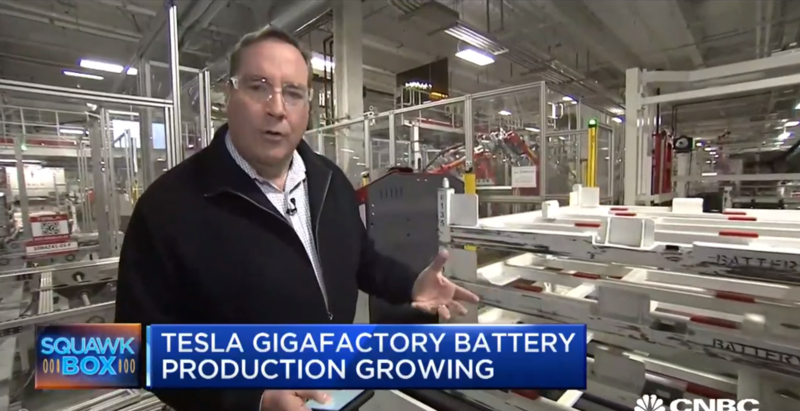 CNBC Announcing Production growth for Tesla’s Gigafactory. 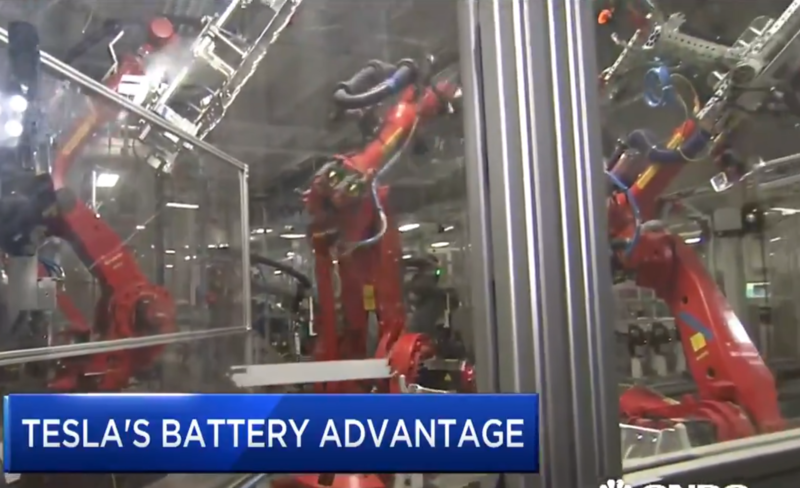 Here’s the same video from CNBC’s website. 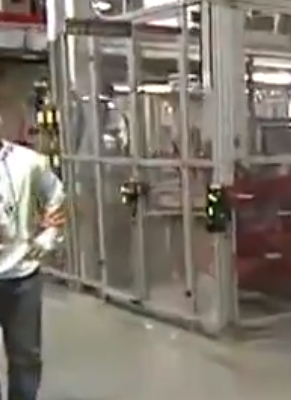 The video begins with the reporter between the crowded space in the factory. 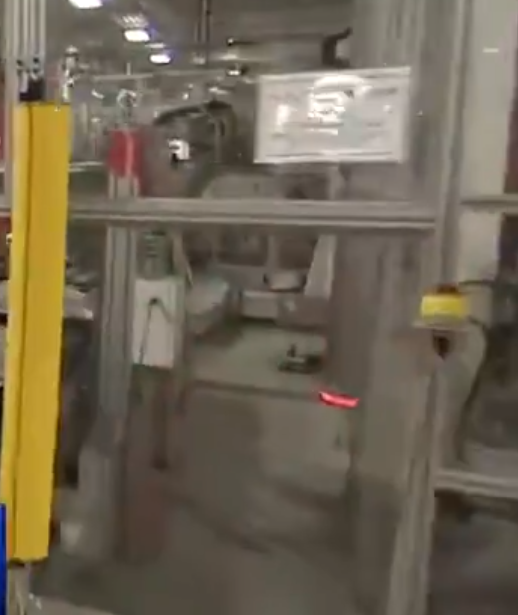 In the beginning of the video, we can see how little space there is on that specific section of the factory, we can tell by the distance between the AGV/UGV and the reporter. Small spaces have consequences, from limiting upgrades/modifications to expansion of the production cell(s), obviously. Even performing Maintenance can hamper the operation of nearby processes (in this case, the movement of the UGV). Also, having tight spaces means you can’t transport/store large volumes of products, forcing you to accelerate your logistics, reduce in-station inventory or improving your UGVs (which is currently the case, as we can see the UGV carrying 4 trays). Towards the end of the video, we can see how little space there is on this corridor. Also, that red light on the floor its used by the UGV to see obstacles in front. Another thing to point out is the naming of the production cells. I am personally against using only coded names for the cells unless there are current countermeasures to mitigate any problem that may arise. There’s a parallel system to give a name to each cell and not just a code. The workload is evenly distributed. That is, that a technician doesn’t have to service cells on opposite corners of the factory, there are enough technicians for each (well defined) Natural Work Team. 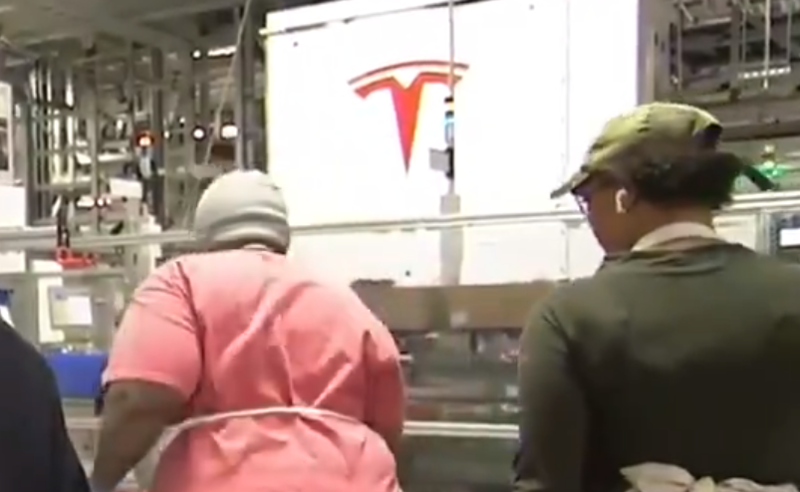 The production line is explicit enough to tell where the problem is (like an andon system). Documentation is both easily accessible and understandable. I’m in pro of making everything easier for everyone independently of their experience/knowledge, that’s why I insist on dumbing down everything as possible, just like I said about manuals. Speaking of Andon, here are their andon Screens. Now, there’s a standardized color scheme for Stack lights, hwever, what’s not standardized is their placement and their identification. In the video, we can see that there are at least 3 Stack lights in front of the 2 operators. It shouldn’t be a problem since they’re not at the same distance and one can tell to which machine each stack light belongs. HINT: Left in red, middle and right in green. However, it wouldn’t hurt to add a sign above/under each of them so we can easily tell which machine is in which state. Motors are powerful even though they’re small. The motors are calculated for a heavier load in case of increase of production. 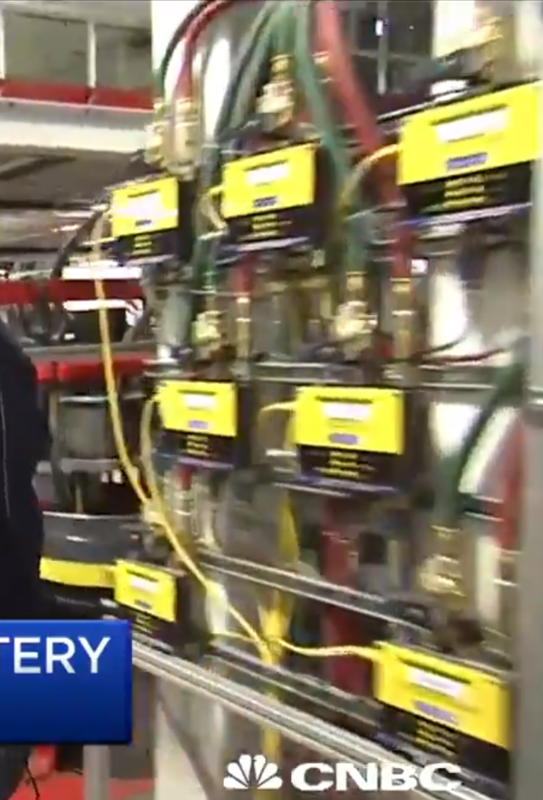 Other thing that makes me wonder is: are they activating them with contactors or with drives? in this case, which is more energy-efficient? The four motors (visible at the side of the cnveyor) evenly spaced. 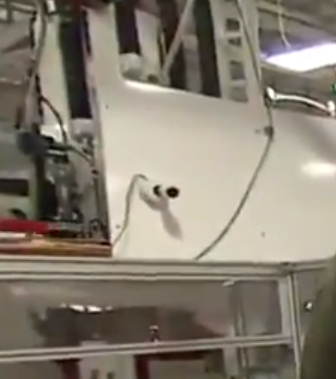 In the first part of the video, we can see in the background lots of Safety courtains. 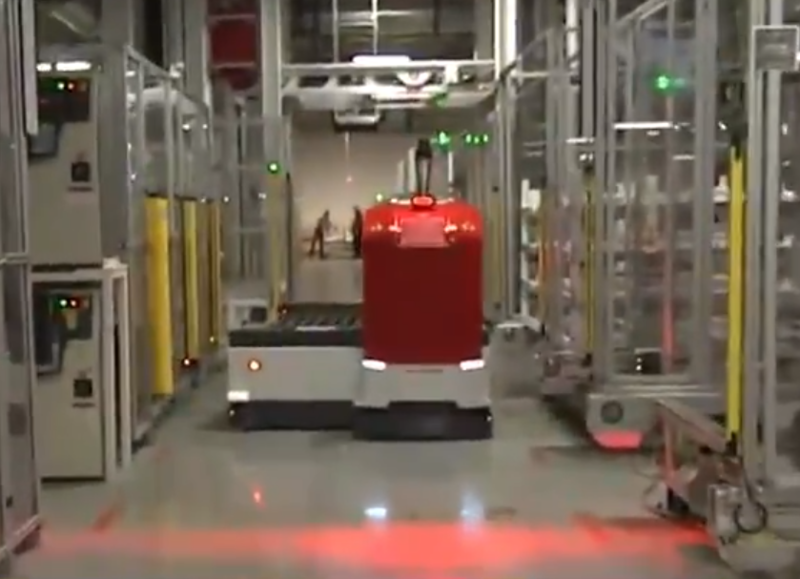 Notice in the video how the led on top of the bar changes from green to red as the UGV unloads the trays. The light courtains I believe are being used are Sick’s C4000 Select (at least in the pallet entrance). 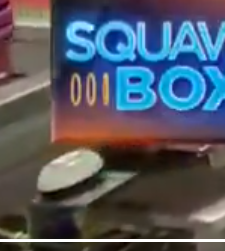 In the picture above you can see Sick’s logo that lays on the side of the courtain. The other courtains I’m going to assume they belong to Sick’s products line, only because one usually doesn’t mix suppliers for the same type of products, but I can be wrong. A courtain and an E-Stop. There are E-stops scattered (as it should), one of those, include Banner’s 30mm Illuminated E-stop. The best feature about this is that you now don’t need an HMI to know which E-stop is pressed since it will change its color immediately. Now there was one E-stop that bothered me, and it’s the one below te keyboard on the operator’s computer. Green circles a Banner light/capacitive Touch button and Red circles an E-Stop. The placement of that E-stop is for a more “comfortable” position, but for a real emergency you would need it to be higher and easily reachable (let’s say, at the same level of the HMI where it currently sits below of). The button on the right of the E-Stop, is one of Banner’s Capacitive Touch Buttons. You can see the flat-tish surface and the touch area of the button. We can see at least 2 MGBs on the video. Sadly I couldn’t find any model that matched the ones they have. What was interesting to me, was that the robotic cell with plenty of robots, has 2 doors right next to each other, which is very rare (because you already have a door, why do you need another one next to it?) unless there’s something that forces such design (like a tool, a maintenance position, or something alike). And lots of them! 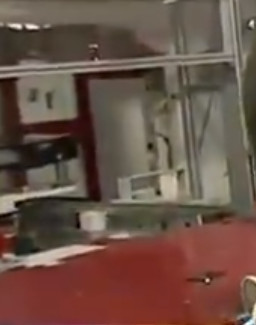 All seem to be fanuc, judging by the controller and the characteristic Yellow label on the red robots. 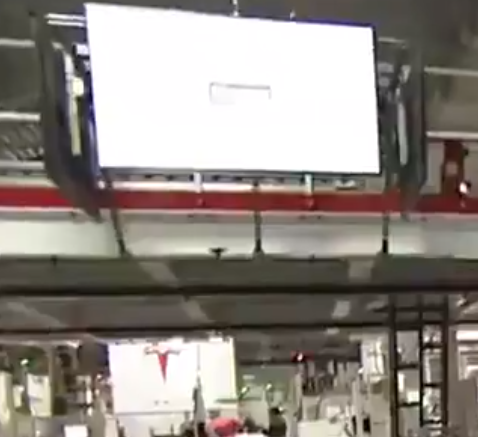 All those white boxes correspond each to a robot. Here you can see the long yellow tags in the upper arm. No other Robot brand has those tags. These valves must be for either welding (there’s one Wre feeding machine around the corner) or cutting (but there are no sparks coming from the cell). They could be externally controlled judging by the yellow cable on the side of the valve. Notice the arrangement and hose routing. Apparently, there have been some missing parts in this station. And it comes as no surprise since the operators handle small pieces that are easily concealable. 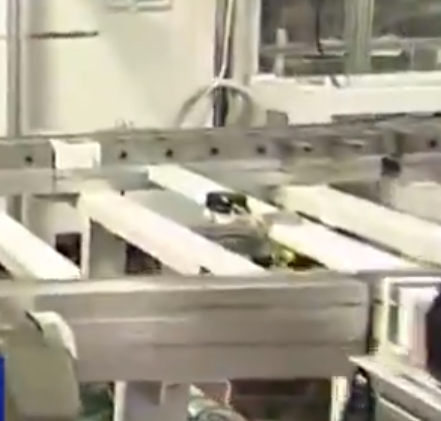 Either that, or the camera is there for optimization purposes, since it’s a manual job (check the tools the operators use), they may be looking for ways to optimize the process or for quality assurance/traceability, it could be that a misplaced part can be really harmful or something like that. 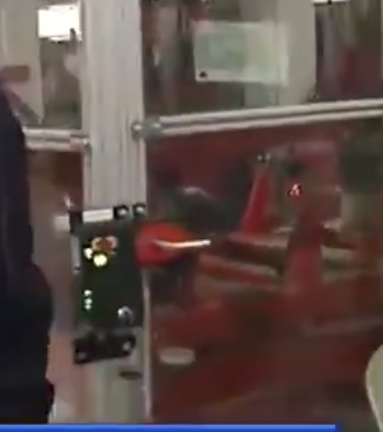 Here we can see they use RFID to track where their products are passing through and when. 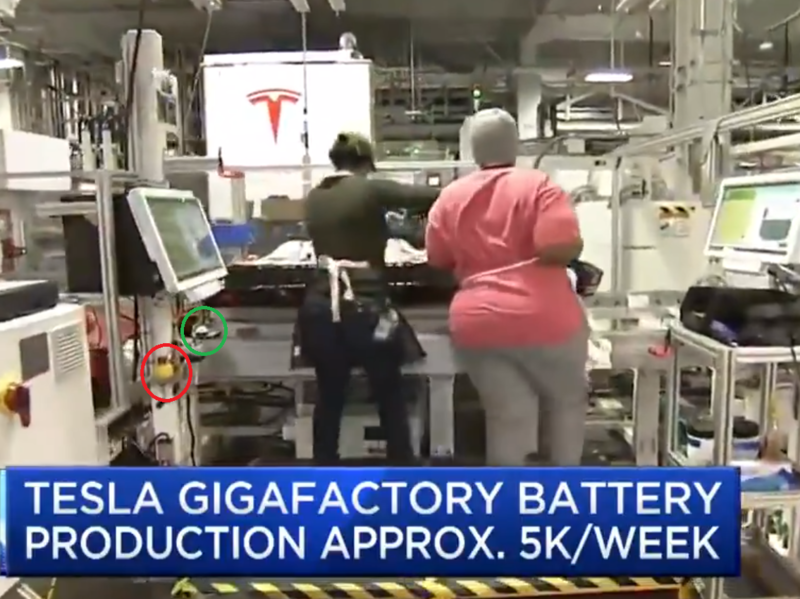 I think they’re using UHF, since HF is only for very small distances and there’s a gap between the lowest part of the tray and the bed where the product sits. In the middle of the red plate you can see another black RFID head. 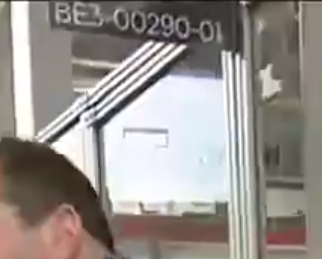 Unless of course, the RFID chip has a special plate that is placed next to where the reader will be. While I have been somewhat harsh on their design, no factory is perfect. However, as mentioned earlier, this can be compensated in several ways that lets the factory be efficient. Previous Post The problems with manuals and how to solve them. Next Post Risoul’s Technological solutions Expo 2018 review: Automation goes geopolitical! Risoul’s Technological solutions Expo 2018 review: Automation goes geopolitical! The problems with manuals and how to solve them.